this was purchased for a drone but they need to operate on the same frequency and this was not made clear both in the drone instructions or the headset .. Might be obvious to some but could be explained more for non nerds. I am sure it is a very good product and good value for money but no good to me.. Casn you swap it for another???. Not a bad piece of kit for the price. can be used with this. Having specifically selected accessories for my phone, I expected the phone to fit in the holder...... but it doesn't. Thus there is no chance of getting the phone central to allow VR viewing. Also, the holder appears to be too shallow since my phone is now sporting several scratches from inserting the holder into the headset. Very unimpressed and returned the item for full refund, and I expect some response from you. Have to chase UPC codes down and download apps to use this item. Apps easy to find UPC code not so easy to find and you have to have all this to play some games. Would recommend this item to someone. Works great once it is all set up its is fun to use. 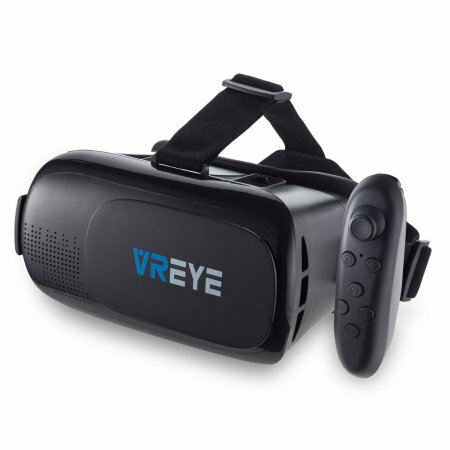 Wanted to try VR, so it is perfect firs set for beginning.Newer tried insanely expensive VR sets before, but this one does the job for me.Lens adjustment isn't very precise and easy to adjust,phone holder too stiff, my nose is a bit on the way(notch too small). Overall comfort to wear 4 out of 5..
VR is good value for money, Paired with a Nokia 6.1 phone it is a good lower end unit. It is comfortable to wear and use. The price is worth it. It's not the best by size adjusting. I don't use the controller because games cost and I'm not really interested in the games they have. So if you a gamer you might want to pass. I loved what you can watch. It sure will take you on a roller coaster. My phone is a Galaxy A3 which is quite small compared to the largest phone the unit can carry. The lenses do not adjust close together enough (for me) and I cannot achieve decent focus unless I hold the set about 10mm away from my face, which suits me as the hard nose bridge becomes very painful after about 20 nano seconds. I need to wear my spectacles too; something the designers might have considered, so I wear an old (narrower) pair and still have to hold the unit away from my face. The remote handset does nothing for me as I have yet to find an app or game that uses it. It WOULD be nice if the headset suggested a test app so I could determine if the remote is paired properly with my phone. I would need a third arm to use the remote or some additional padding to keep the unit distanced from my face. Pairing is tricky as, without any button action, seems to go to sleep faster than my phone takes to find it, so the pairing process was somewhat frustrating. All in all, the headset seems designed for a nose less species of homo sapiens. The remote may work fine but without an app that uses it, I have no positive comment. Disappointing optical performance for what is a plastic box of plastic optics.